When it comes to men and fashion, things can get a little tricky. While the ladies were younger and exploring emergent fashion trends, most men were busy debating with the guys about who was likely to win the super bowl or the world series that year. And if we weren’t talking sports, then we were playing sports. Simply put, not many men spent a lot of time diving into the fashion space. Most guys end up realizing this when they struggle to properly match their shirts with different ties. How to Match Shirts with Different Ties is an art, and it requires basic knowledge of color harmonization and how to bring together different elements into one combined piece. Let’s look at some helpful strategies that you can follow to turn yourself from a color-clashing agent into a harmonizing superstar. 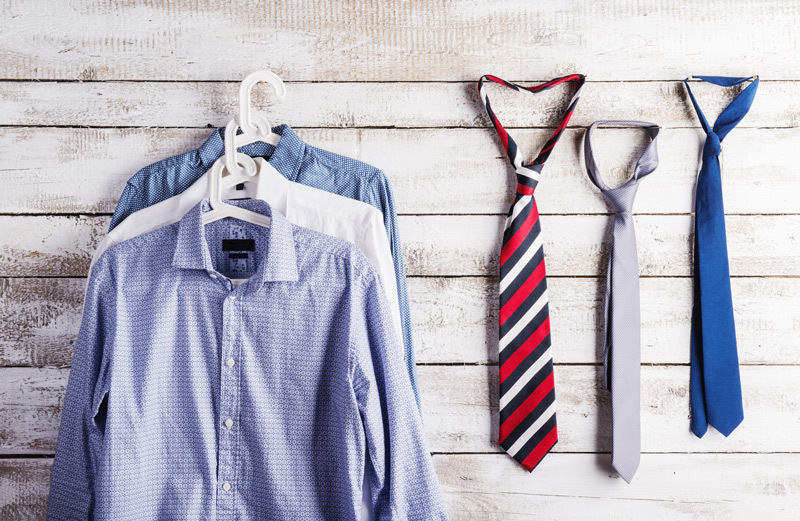 Mastering these 3 distinct elements will make you a master class tie and shirt matcher. When wondering how to match your shirts with different ties, you should first consider the color. You can start your color discovery journey by using a color wheel. If you don’t already have one, print out a color wheel and stick it right in front of your closet. It will be your best friend for a long time to come. A color wheel is a scheme that arranges different colors in terms of their harmonization, i.e. how well the colors go together. Harmonization can only be truly achieved once there is a sense of balance and order between your tie and shirt. A great way of achieving a harmonious color scheme is to match warm and cool colors. Warm colors tend to be more vibrant, and include red, yellow and orange. On the other hand, the cool colors include blue, green and purple. If you pick a warm tie color, make sure the shirt is a cool color and vice versa. Another strategy is to use various shades of the same color. If your tie is a darker shade, make sure the shirt is a lighter shade. This is commonly referred to as the monochromatic color scheme technique. Tones and patterns often go hand in hand, and knowing how to work the patterns of your shirts and ties will earn you first class honors in shirt and tie matching. When referring to tone, we basically mean what color and feel is given off by a specific item of clothing. As an example, a white shirt with bold blue stripes gives off a mostly blue color. The white is the minor color while the blue is the major color. The more the major color is pronounced, the higher the tone, and vice versa. The safest way to work with patterned shirts is to simply add a solid tie on top. You can never go wrong with this, as long as you remember to choose harmonic colors to form the color wheel. With patterns, you should always consider the major color on the shirt/tie and use it as the reference point for matching. For example, if your patterned shirt gives off an overall warm color, you should go with a cool solid tie to match. The same strategy holds true when using a patterned tie on a solid shirt. The color chosen for the shirt should complement the major color on the tie. Use different size patterns on the shirt and tie. Since the tie is smaller, larger and bolder patterns on the tie give a cleaner, sophisticated look. The shirt underneath should have smaller size patterns to create a contrasting background. In this case, you can use the same patterns on the shirt and tie (such as both stripes, both polka dots, both checked) as long as their sizes and scale vary. Patterned shirts with fine stripes or checkered boxes can serve as a great backdrop for dotted ties. The trick lies in complementing the dots with the major color of the shirt. This gives off a coordinated look and a continuous feel across the entire outfit. Light-blue-dotted ties can be used on a darker-blue-shirt, while white dotted ties can complement darker and cool-colored striped shirts.